Today I have what is sure to be an interesting Belgian brew produced by Lefebvre Brewery. I found this 11.2 oz beer on the shelves of The Four Firkins and had no clue what it was aside from the neat ancient looking symbols on the bottle and the very reasonable price tag of just a couple dollars. After reading a bit it appears Lefebvre has a very long family history dating back to 1876 but this particular brew wasn’t distributed until more recently in 1996. 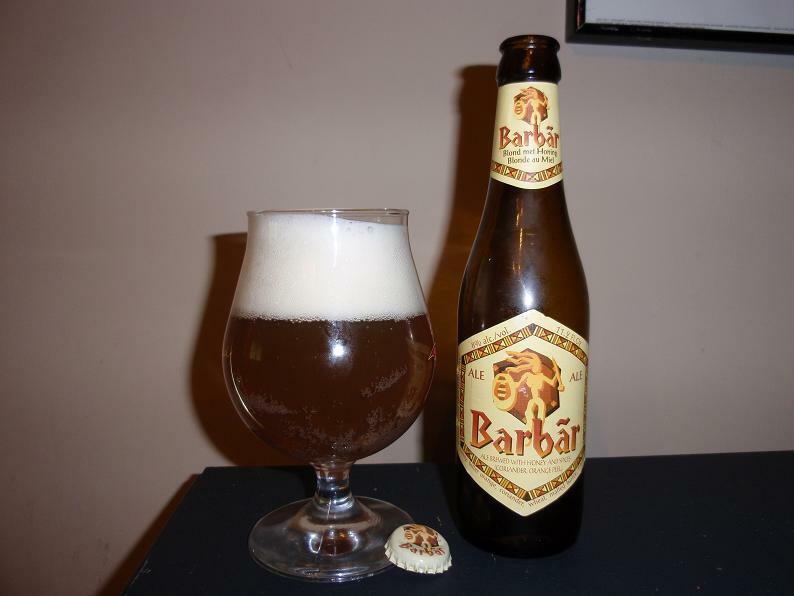 Barbar is said to be based on ancestral knowledge of the brewer and was crafted with some very interesting ingredients including honey, bitter orange, coriander, wheat and of course water, barley, hops (Hallertau & Styrian) and their unique yeast strain. This ale pours a unique hazy brownish copper hue that is very opaque but doesn’t appear tio have any sediment present. Head is a solid four fingers of tight pure white bubbles that slowly dissipates leaving a solid millimeter of head on the surface even after over ten minutes and a small amount of lacing around the glass. Aroma is also quite unique, smells strongly of rich spicy honey, oranges and caramel. This is unquestionably a sweet beer but the gentle coriander and alcohol notes do a decent job making the aroma a bit more dry. Flavor is much lighter than the aroma but still contains plenty of herbal notes, a moderate does of honey, soft caramel, a good deal of pale malty sweetness which is contrasted by a nice light wheat character and gentle citrus hop notes. Body is quite light for such a strong ale and the mouthfeel is nicely carbonated and not overly sticky particularly considering the honey used in this brew. With an ABV of 8% this isn’t something you can drink all day but the sweet flavor of the brew may make you think otherwise. If you enjoy Belgian Strong Ales and are looking for something with additional sweetness and spices this might just be the beer for you. The aroma of this beer really blew me away though the flavor in contrast seemed a bit lackluster, regardless this is a neat ale that shows you can make a successful brew with unique ingredients. Something I would happily consume again, particularly at a reasonable price. Give it a shot and ride your bike.